Americans’ fear surrounding China’s economic impact on U.S. jobs and manufacturing has affected U.S.-China trade relations. According to Saif Rahman, the Robert Bauman associate professor of economics at Ohio Wesleyan University, the origin of such fears is often misunderstood. Rahman, using economic data and analogies, focused on decoding U.S. fears surrounding trade relations with China during Friday’s Great Decisions lecture. “It seems like most of our conversations regarding U.S.-China trade or U.S.-China relations is coming in the midst of adversarial thoughts,” Rahman said. 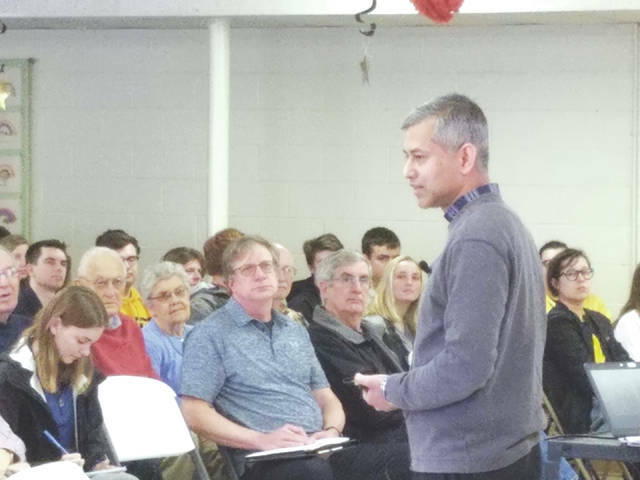 In the fellowship hall of the William Street United Methodist Church, the audience listened quietly as Rahman asked numerous speculative questions. He pondered if America’s fears originate as a battle of ideas of freedom and human rights, a battle for national supremacy, or a worry about deficits versus surpluses. The lecturer first discussed America’s traditional foreign policy stance and the promotion of beliefs abroad, such as freedom. Rahman explained how some Americans are concerned with the relationship between U.S. and China because of the differing ideological principles between the nations. Later, grunts of speculation rose from the audience as Rahman questioned whether Americans’ fears originate from a desire to be No. 1. Laughter then followed his analogy to the “We’re No. 1!” chants at college basketball and football games. “I do see a propensity … to compare ourselves with other countries or other cultures and somehow feel much better about what we have when we can say that we are better than them or that we are No. 1,” Rahman said. China is ranked as the world’s top economy by the World Bank. However, the ranking is based on outdated economic numbers and terms. Rahman used this idea to transition into Americans’ fear of deficits with China. “Running a deficit is not in it of itself a problem,” Rahman said. To clarify his point, Rahman presented an analogy of personally running trade deficits with the grocery store. Rahman also included a variety of facts that discredit many of the fears about U.S.-China relations. The U.S. is an exporter, while China has become known as the assembler. Therefore, the majority of products that are labeled as “Made in China” are actually made up of a lot of American materials, according to Rahman. “If the size of the deficit with China is part of what we are worried about then rest assured that it is not as big as what it looks like because there is a lot of U.S. components that are in those things that are labeled ‘Made in China,’” Rahman said. Approximately 55.9 percent of the profits from such products actually stay within the U.S., according to a chart Rahman showed. “So, if we basically say ‘we won’t allow Chinese products like Nike to come in’ we are killing American jobs,” Rahman said. To further analyze fears of the decline of American manufacturing jobs, Rahman presented statistics to prove that output is still increasing. Such employment decline could be a result of the U.S. learning how to manufacture things better, he said. Blaming China when searching for betterment of our country is not the best solution, Rahman said. The professor emphasized that other U.S.-China trade concerns regarding safety protocols, human rights and the environment are legitimate and approaching Americans’ fears through the narrow channel of trade deficits misses the point. Rutherford B. Hayes High School’s AP U.S. Government and Politics class also attended the lecture. The next Great Decisions lecture will be April 12, featuring Jeremy Baskes, professor of history at Ohio Wesleyan University. He will discuss the partnership between the United States and Mexico. The free community discussions take place at the William Street United Methodist Church, 28 W. William St., Delaware. Erin Ross is a junior journalism and communication double major at Ohio Wesleyan University.